SNAFU! : Forget Homeland Security...revitalize Civil Defense! 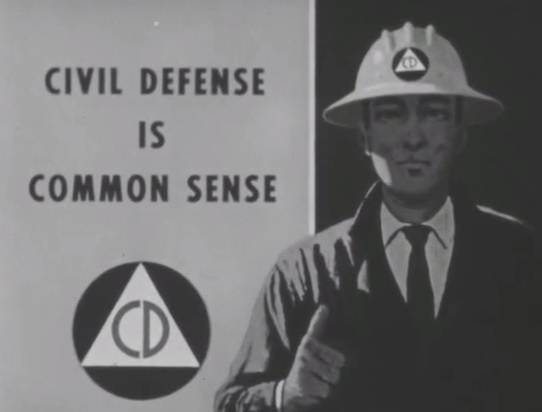 Forget Homeland Security...revitalize Civil Defense! It's time to revitalize Civil Defense. During the 1950's the American people had fresh memories of the dropping of the bombs on Japan and the Soviet Union was seen as a clear and present threat to the survival of the nation. Fast forward to today and for a variety of reasons the average American seems stuck on stupid. Instead of taking steps to ensure that their families avoid being refugees in HUGE centers (I can't imagine the craziness involved in having to stay in a center with upwards of 5K people inside.....I watched the Katrina madness and after that became DETERMINED to never allow that to happen...I became a prepper after that incident!) they would rather roll the dice and take their chances. Consider it NORMALCY BIAS on steroids. We need to start an education plan that for the first week, maybe two, help will not be available. The American people must be trained and conditioned to handle an emergency in house for at least two weeks. This will not be pleasant. This will require a change in mindset and will be an admission that the state is NOT all powerful and that individuals are responsible for their own safety and that of their families. Houston, Katrina, Rita, Sandy and other events have proven otherwise. But consider this. Houston is the first disaster we've seen in a US MegaCity. The outcome is still undetermined and I believe the economic impact yet to be felt. But in comparison to what we could see this is nothing. An earthquake in California affecting Los Angeles, or an electrical blackout in New York lasting only a week would be potentially more catastrophic. The American people NEED to get hard. We need to get fit and self reliant. It's the only way forward that makes sense.